Comedian Jason Byrne hosted this year's ceremony. THE BEST OF Ireland’s television talent came together last night in a celebration of their work over the last year. 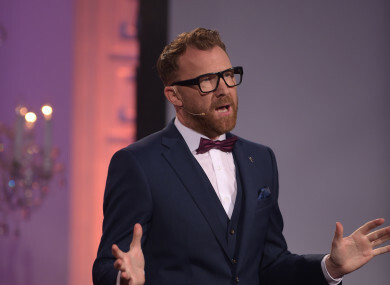 The host for this year’s IFTA Gala Television Awards was comedian Jason Byrne and the ceremony took place at the RDS Concert Hall. The award for best comedy or soap writer went to Lisa McGee for Derry Girls, which is about a small group of teenage girls growing up in the 1990s in Northern Ireland. The show also won the best comedy award. Peter Foott, director of the popular Young Offenders show, took the award for best director in comedy or soap. Chris Walley, who plays Jock Murphy in the comedy show also came out with the Male Performance Award. The winner in the Female Performance category was Sharon Horgan who dedicated her award to “Mná na hÉireann”. TV’s Red Rock won the prize for best soap. The award for TV presenter of the year went to Marty Morrissey, who said it was “one of the best nights of my life”. He said winning the award was “a great honour”. Morrissey was not on hand to accept his award immediately as he was presenting Bloom Live but gave a speech to the assembled crowd at dinner afterwards. Gogglebox Ireland, Dancing with the Stars and Room to Improve also all bagged the awards in their categories. Room to Improve presenter-architect Dermot Bannon paid an emotional tribute to teenager Michael Stokes, a previous star of the show who died in an accident just last month. Broadcaster Shay Healy received this year’s lifetime achievement award for a distinguished career in writing, music, comedy and presenting. Healy, who has been battling Parkinson’s Disease for some years, brought the audience to its feet with a warm and witty acceptance speech, joking that he was glad he had received the award now as “posthumous awards are not all they are cracked up to be”. The RTÉ Investigates programme Nightmare to Let, which focused on the experiences of people living in sub-standard rental accommodation in Ireland, won in the Current Affairs category. Email “Derry Girls and Young Offenders win big at the IFTAs”. Feedback on “Derry Girls and Young Offenders win big at the IFTAs”.